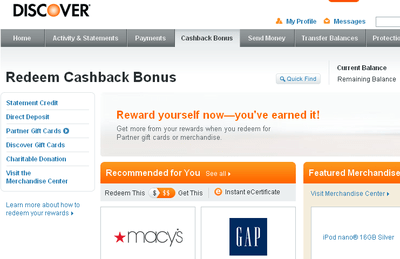 Home / Credit Cards / What is the Best Way to Redeem Discover Cashback Bonus? I have been using my Discover card for almost all the purchases. Now, I have $501.02 in Cashback Bonus. You can redeem your reward starting at $20 Cashback Bonus. Statement credits and direct deposits are only face value so skip those options if you can. When you choose get a Partner Gift Card you get a bonus $5, $10, $20 or double the amount. So every time you redeem $45 in rewards for a Macy’s or a Sears gift card you will get a $50 gift card in total. That is, $45 gets you $50 ($5 free). Redeem $80 in rewards for a Gap gift card you will get a $100 gift card in total. Bottom Line: You’ll get more value for your money when you purchase Partner Gift Cards. Discover is a great credit card to have as it offers 5% Cashback Bonus in rotating categories that change monthly like travel, department stores, gas, groceries, restaurants , etc and 1% cash back bonus on everything else. Cashback Bonus can be redeemed easily online or by calling 1-800-DISCOVER. Previous post: What is Credit Card Payment Protection?